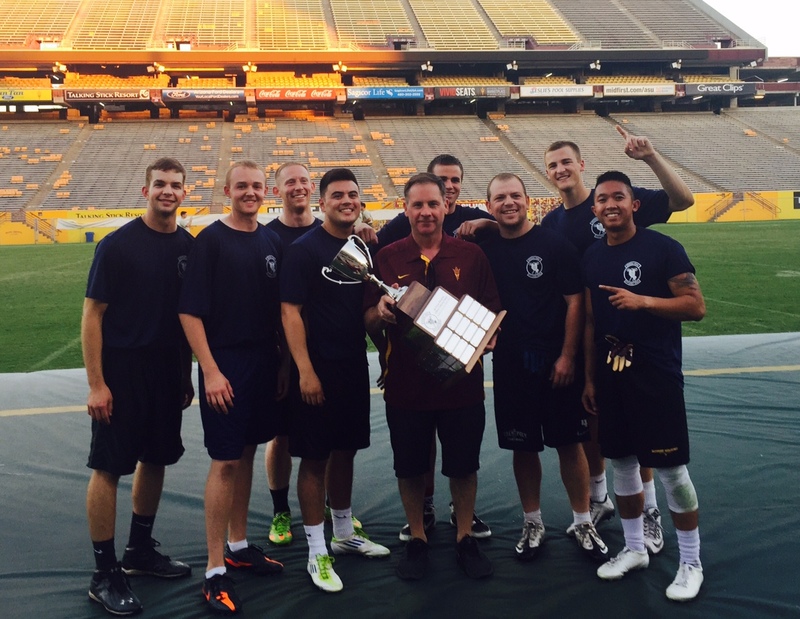 Student veterans, cadets and midshipmen will gear up for the second annual flag football tournament to honor America’s service members for their courage and sacrifice as part of Arizona State University’s annual Salute to Service celebration. The college will be hosting the second annual Salute to Service flag football tournament from 9 a.m. to 1 p.m. Sunday, Nov. 5, at Sun Devil Stadium. Fans are encouraged to come watch and join the college for a morning of competition, community and camaraderie. Since the founding of the Department of Military Science in 1935, the college has been the proud sponsor of ASU’s three Reserve Officers’ Training Corps programs. ROTC cadets and midshipmen from Aerospace Studies, Military Science and Naval Science along with student veterans from Pat Tillman Veterans Center will contend for the esteemed Dean’s Cup. The winning team will be presented with the Dean’s Cup to commemorate their victory by the college and will have the honor of “owning” and proudly displaying the trophy until next year’s event. The flag football tournament is just one of more than 30 military-themed events hosted during ASU’s Salute to Service celebration taking place Nov. 1 to 12. It is an opportunity for the Sun Devil community to show their pride and support for military service members — past, present and future. The event is free and open to the public. Fans should enter the Sun Devil Stadium from the Southwest entrance.